Indirect fire requires a sighting sub-system to aim the gun at a target that is invisible from it. Indirect fire was created by the invention of sights that did not have to be layed (pointed) directly at the target. These sights accurately point the gun in the direction (line) of its target and with the correct angle of elevation for the shell to reach the target. The need to set the elevation to achieve the required range had been known from the early days of cannons and simple mechanisms were developed to enable it. However, pointing the guns so that they could easily attack unseen targets was a more difficult problem. The 'breakthrough' came with the German invention of the 'Richtfl�che' in the early 1890's. This instrument comprised an open rear and foresight mounted on a bar that rotated against an angular scale. By the early 20th Century the open sight device was replaced by an optical device, called a 'dial sight' by the British. The basics of gunnery and how sights were used to point guns at their target is explained in 'The Basics of Gunnery' and for more detail about indirect laying and its evolution see 'Laying and Orienting the Guns'. In the early days, throughout World War 1 and in some armies up to the present time, laying in line and elevation was carried out by two men working together. In other armies a single man did all the laying, and in World War 2 (WW2) this was the British preference. It required appropriate sighting arrangements. The British approach in this period was integrated line and elevation laying in one sight unit. Its two main elements were a 'dial sight carrier' and a dial sight used together by the single layer who also operated the traverse and elevation handwheels to physically move the barrel and lay the gun. Firing data was ordered from the command post (CP) to the guns in degrees and minutes relative to the zero line for the bearing and yards for range. This meant that for simple shoots a CP could order a single switch from the zero line and a single range, which was used by all guns in its troop. This enabled a fast response to a call for fire because the CP did not have to calculate and then order an elevation angle for each of its guns. The angle of sight was ordered separately, if it was required. 'Fire Discipline' provides more details on the form of these orders. The basic procedure, explained in 'The Basics of Gunnery', was to orient the dial sights so that the guns of a battery were parallel in their zero line. This was usually done using the director, but alternatively guns could be given an angle to a distant aiming point. The Nos 6 and 7 Directors had replaced the WW1 vintage No 4 during the 1930's. The only difference between No 6 and 7 was that No 7 could measure vertical angles from 15� depression to 65� elevation, which made it more suitable for surveyors. The angle ordered was set on the dial sight's main scale and the gun was traversed until the sight was aimed at the director (or aiming point), this meant that the gun was layed (pointing) along its zero line. Using the sight's main scale, and without moving the gun, it then recorded the angles to at least two gun aiming points (GAP). One was selected for current shooting, the dial sight layed on it and the slipping scale (sometimes called the 'shooting scale') was adjusted until it read Zero and then clamped to lock it to the main scale. Firing data, switches from the zero line, were applied using the slipping scale. The No 7 Dial Sight was introduced for field artillery in 1910. 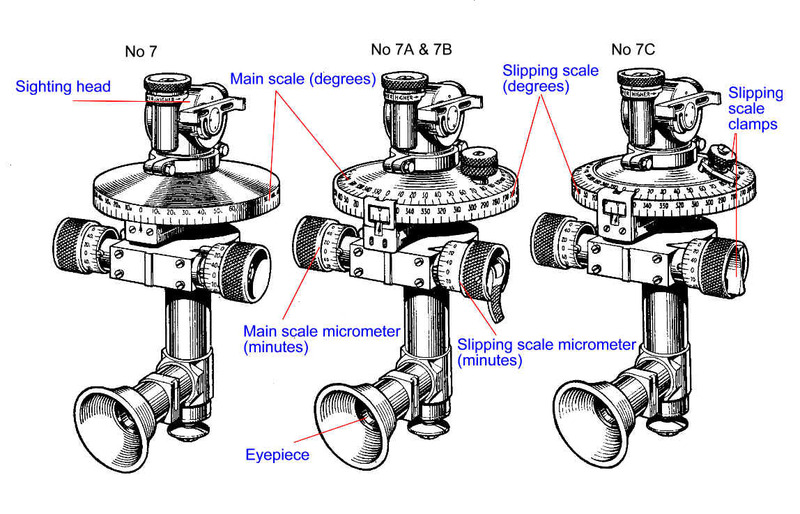 The original No 7 was based on German patents, but it did not have a slipping scale. This was first introduced with the No 7A just before the outbreak of WW2 and featured on all subsequent dial sights, in 1943 a new sight, No 9, was introduced and lasted with modification into the 1990s. Dials sights had a periscopic configuration with a rotating head, when the scale was set to zero the sight head was aligned with the axis of the barrel. At least one of the GAPs had to be usable at night, and hanging lamps on distant church steeples was not an option! This meant that while distant GAPs were suitable for daylight use other arrangements were required at night (or fog), in close country and in open featureless country such as the desert or jungle where there were plenty of 'features' but none distinctive. Troop pickets about 300 - 600 yards from the gun were used, but could lead to inaccuracy and could still be obscured in bad weather, so closer GAPs were required. The problem was that guns, or more specifically their sights, move. For example on soft ground guns move backwards when firing as the spades at the end of the trails 'bed-in'. This was not a problem for 25-pdr when using its platform but was for the split trails of the 5.5-inch. Sights also move when guns traverse because the sights are off-set from the gun's traverse pivot. These movements change the angle between the dial sight and its GAPs. For example, if a sight moves 12 inches and the GAP is only 50 yards away then in the worst case the angle to the GAP changes by about 2�, which represents about 350 yards on the ground if the guns are firing at a range of 10,000 yards. However, if the GAP is 2000 yards away a 12 inch move of the sight is an angular change of some 3', about 9 yards at 10,000 yard range. There were two complementary solutions to this problem, procedural and technical. The procedural one was the "Check Zero Lines" procedure, normally conducted at first and last light, before fire plans and on any other occasions it was considered necessary. It involved each gun reporting their angle to a director where it was compared to the director's angle to the gun, and if different a new angle was ordered and GAPs re-recorded. The technical solution was to use close GAPs that approximated infinity when distant GAPs weren't available. The British used two of these, aiming posts and the parallelescope. The latter was a narrow mirror set up about 10 feet from the sights, basically the dial sight was layed on its reflection in the parallelescope. The idea behind both parallelescopes and aiming posts was to provide an aiming point close to the gun that acted as if it was a distant one. Figure 4 shows how it worked with a parallelescope. Aiming posts were used in pairs by each gun, the posts being planted at about 50 and 100 yards from the gun. To reduce the scope for mistakes between guns in each section one gun had posts with circular tops the other with square tops. Initially the posts were planted in line with the dial sight, as the sight moved a gap appeared between the two posts when viewed through the sight, the layer then looked for the pair of numbers on the cross bars that were closest and layed on the rear one. In Figure 5 the actual aim point would be '6'. The dial sight was mounted in a dial sight carrier that was fixed to the saddle on the left hand side of the gun. However, in the mid-1930's the British introduced Probert pattern calibrating sights. These dial sight carriers had an integrated gun rule,. It enabled the gun to be layed in elevation when given a range. 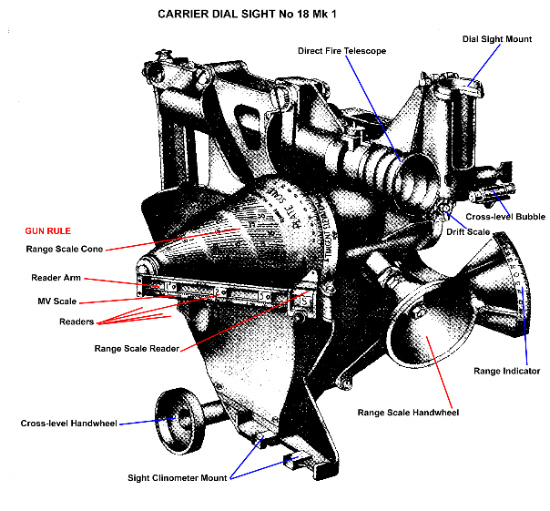 For this the carrier had a fixed part and a part that rotated in the vertical plane, carried the sight clinometer and connected to the elevating mass. Probert pattern sights first appeared on an upgraded version of the WW1 6-inch howitzer in the 1930's and remained a uniquely British instrument throughout WW2. Gun rules grew out of the improved fuze indicators introduced for shrapnel shells during WW1. A gun rule produced a corrected range to compensate for the difference between a gun's actual MV and the standard one. A calibrating sight combined the functions of the separate gun rule and the range dial. To achieve a given range on the ground the angular elevation of the gun has to be adjusted for the muzzle velocity ( MV) of the individual gun. This MV changes as the barrel wears throughout its life. In all armies except the British the correction for individual MV was calculated in the command post (or its functional equivalent). The gun rule did it 'automatically' on the gun, this simplified procedures and saved time. The Probert pattern sight had a vertical flat range scale, first used on the 6-inch How and subsequently on the 4.5/5.5-inch Gun and 7.2-inch How. That for a 7.2-inch is shown in Figure 6, the gun rule component was almost identical with that of the 5.5-inch, but there were differences between dial sight carriers to accommodate mounting on different guns. The range scale was graduated with lines representing distances in yards for the spread of MVs, with elevation angles at the outer extremity. Fitted to the range arm were readers for each charge, these were locked in position against the MV scale at the gun's MV for that charge, and only changed when the gun's adopted MVs were changed. The range scale reader was clicked into position over the reader for the charge ordered in a shoot and set against the ordered range, this meant that the reader arm was moved up the range scale from its pictured position, using a quick release and then the handwheel for fine adjustment. Moving this tilted the part of the sight carrier that included the sight clinometer. Once the gun rule component and sight clinometer were set the gun was layed by elevating the barrel until the bubble in the sight clinometer was level. The 25-pdr calibrating sight was different. It was a Probert pattern sight but the range scale plate was wrapped into a rotating cone while the reader arm was in a fixed position. In this case the range was set by rotating the cone using its handwheel until the ordered range is aligned with the range scale reader. Again this tilts part of the sight carrier, so the barrel is elevated until the sight clinometer is level. The 3.7-inch How as different again, it used a drum shaped 'range indicator' with the MVs scales on the end. Of course not all guns in British WW2 service had calibrating sights, most notably those of US origin. These were provided with separate gun rules, in a large slide rule configuration and operated by a member of the gun detachment who set the range and read out the elevation angle to be set on the sights using the field clinometer. Similar gun rules were also used when the 80-lb shell was first introduced for the 5.5-inch Gun. However, when intermediate charges were introduced for the 25-pdr extra readers were fitted to the reader arm of the calibrating sight. Some projectiles such as smoke and star had significantly different MVs due to their weight difference from the standard HE shell so the MV scale on the gun rule was inapplicable. For these projectiles the CP ordered 'false ranges' that compensated for the difference between the MV for the standard HE shell and the MV of the non-standard type. The same technique was also used with intermediate charges when the gun rules were un-modified. With separate gun rules the range scale slider was reversible with range scales for other charges on the other side. The charge pointers were locked to the current MV, the charge mark on the slider was set against the charge pointer for the ordered charge and the elevation angle read for the ordered range, then set on the field clinometer (see below). The dial sight carrier had a second function, it could be 'cross-leveled to compensate for trunnion tilt. Trunnion tilt occurs when the gun is on a sideways slope. In WW1 trunnion tilt had to be compensated for by calculating a correction to the horizontal angle (when it was significant). The WW2 dial sight carriers enabled the dial sight to be cross leveled so that it was vertical not matter how much the trunnions were tilted. Sights of this type are called reciprocating. The British gun designers invariably used reciprocating sights, this meant they could be cross-leveled when the trunnions were not horizontal (because the gun wheels were unlevel) to ensure that the dial sight was vertical. The sight clinometer mounted on the dial sight carrier provided the leveling bubble for laying in elevation, it was also set with the angle of sight (the angle between the height of the gun and height of the target above sea level). Similarly drift could be set on the sight mounts and accounted for in the cross-leveling. Drift is a small lateral correction to compensate for the shell's spin causing it to veer slightly. The elevation indicator was just that, it showed the barrel's elevation in degrees. Every gun also had a field clinometer for elevation laying. This provided an alternative if the integrated gun rule was damaged and was also used for shoots where greater precision was required or when the gun rule was not integrated. It was placed on the clinometer plane, normally a prepared surface on top of the breech. Obviously it was important to ensure that the sights were accurately aligned with the bore of the barrel. Quick sight tests took place daily and during fire plans, and full sight tests were weekly. In 1956 UK stopped using zero lines and switches, guns were initially oriented in their 'centre of arc', a grid bearing, and CPs ordered line as a bearing in relation to grid North. This completed the change that started before WW2 when sights were changed to 0-359� instead of 180� left and right. Switches, in the form 'More' or 'Less' relative to the last data ordered continued to be used. NATO standardisation led to mils, metres and metres per second becoming the standard units of measurement instead of degrees, yards and feet per second. This meant that the British had to change their range tables, fire control instruments and sights. In the mid 1950's the UK introduced a small number of 155-mm M44 SPs and these received a new dial sight, the No 1 (mils), which was a No 9 converted to mils, it marked the first step in the change that was completed in 1967 when 25-pdr range tables were re-issued with mils and metres (although by then the 25-pdr had left front-line service). The No 1 (mils) dial sight was renamed the L6 and was used with the Honest John FFR, 8-inch and 175-mm as these were introduced in the early 1960s. It was also used with 25-pdr and 5.5-inch when these were converted to mils, metres and metres per second and received new gun rule scales and sight clinometer. However, with M109 UK, in common with most other European users, adopted a German dial sight and mount. The problem being that unlike all its allies the US remained wedded to deflection sights, a source of regular amazement to the rest of NATO who had moved on. The first new dial sight was the No 3 periscopic dial sight used with the Abbot 105-mm SP, all its scales were displayed internally to the layer when looking through the sight at the aiming point. A new dial sight, the L7, was introduced with the 105-mm L118 light gun, this was distinguished by using Trilux nuclear light sources for internal lighting. At the end of 2002 the British become one of, if not the actual, first to retire the dial sight from the field force artillery by completing their deployment of electronic gun laying devices for all guns and fought the 2003 Gulf War without dial sights. Both 105-mm L118 and 155-mm AS90 had integrated orientation and electronic gun laying that did not require external aiming points. In about 1957 a new parallelescope was introduced. This had a long prism instead of a mirror, which provided a reflection over a wider vertical arc. This meant it could be set-up lower to the ground on a stand using steel pickets hammered into the ground, which greatly reduced the risk of the parallelescope being knocked over by accident or incoming artillery fire. 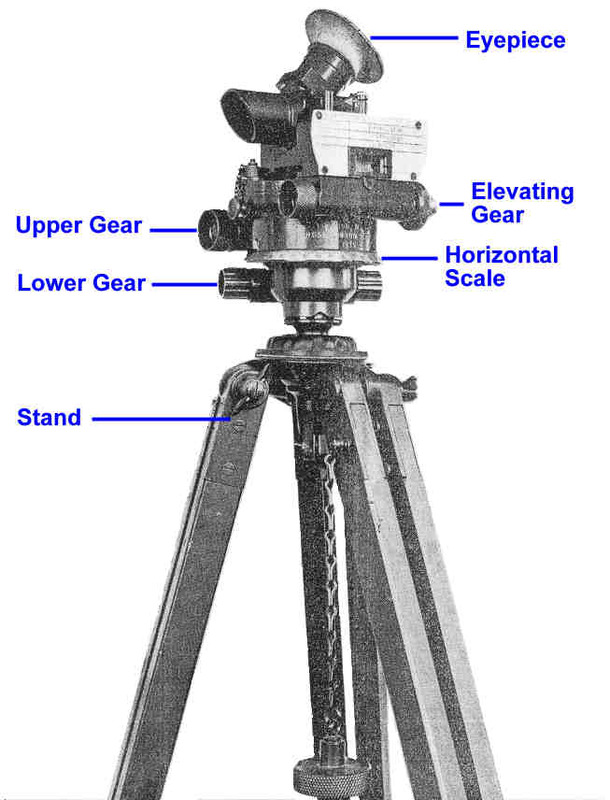 However, a 8-foot tripod was also introduced when the new parallelescope was used with turreted SPs. US pattern aiming posts were also adopted, but not greatly used. The introduction of mils meant that the No 7 director was converted and used until it as replaced by an entirely new L1 Director in the mid 1960's. The increasing range and number of charges, coupled with high and low angle fire meant that calibrating sights had to be abandoned because they became too big. The British therefore adopted a separate gun rule that did not provide data for the higher charges throughout their full range. These were fitted to their SP guns of both British and US origin. This gun rule comprised a sealed box with a range drum and reader for each charge, the front of the box was transparent with shutters that were moved to expose the range drum for the charge in use. The Italian manufacturer Oto-Melara provided a set of separate circular engraved metal gun rules (one per charge) for their widely used 105-mm pack howitzer and this was copied by Australia for use with their US built 105-mm M2A2 in Vietnam. Gun rules disappeared from British service with the arrival of electronic computers (FACE). For more detail see 'The Computer Age'. Copyright � 2003 - 2010 Nigel F Evans. All Rights Reserved.